The Wedding Proposal - Shane's Dreams of Disney came true! The shot right before the Proposal! Hello, my name is Shane and for those who have not read this post, my fiancée and I got engaged down in Walt Disney World in Orlando, Florida and I would like to recount the events leading up to one of the happiest moments of my life up until this point. Myself, Stephanie (my fiancée), and Kyle (my brother) had the opportunity to visit Disney World this year by the generosity of the writer of this blog, who happens to be Stephanie’s Uncle Mikey. The week up until the proposal was a particularly stressful yet remarkably enjoyable time of preparation for the perfect moment that was a surprise for Stephanie. 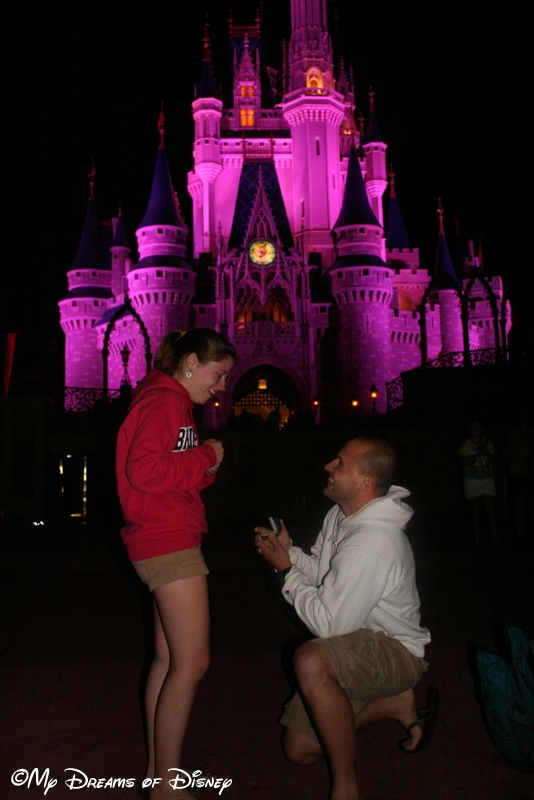 I shared with her uncle my plan to propose in Disney and we decided that a night while in the Magic Kingdom during Magic Hours would be best. Magic Hours, for those of you who do not know, is a special time that the park opens either late at night or earlier in the morning for people who stay at the resorts. This afforded me a little more privacy in the proposal but as you will see also made it special for Stephanie! Before making our trip, I had been asked almost as many questions as conceivable by my fiancée, Stephanie, about the proposal. She asked if I had a plan, if I had talked with her dad and if I would give her any clues. Fortunately, I did not break! We arranged for Stephanie to stay with her uncle at the Animal Kingdom Lodge while my brother and I would stay at the Pop Century Resort. We arrived down at Disney World and being confident in my plan we made our way to the day of the proposal without incident. Whew! Kyle, Stephanie, and I spent the morning of the proposal in Animal Kingdom riding several of the rides and seeing the shows. We attended the magnificent Tusker House for lunch and had pictures taken with several of the Disney characters such as Mickey, Minnie, Donald, Daisy, and Goofy. After lunch, we returned to the Animal Kingdom Lodge because Stephanie had some homework to finish. After spending time at the Animal Kingdom Lodge, I left to retrieve the ring from our room at Pop Century Resort and pick up some grocery items. This marked the onset of my nerves because I needed to convince Stephanie that I should go by myself (so she wouldn’t see the ring of course) and she should stay there to finish her homework. I was able to convince her and left with butterflies in my stomach. I retrieved the ring, stored it safely and secretly in the water storage part of my Camelbak, a place I knew she would never check, and made my way to the store. While in route, a terrible storm began rolling in and I was hoping to collect everything from the store quickly and beat the storm back to the park. Unfortunately, I did not make it out of the store long before walls of rain began beating the car and blocking my view. I ended up getting lost which added to the amount of time it took me to return. I finally returned to the lodge with the ring in my possession and the items from the store. I spent some time consoling my fiancée about the homework she had left (its not like I had anything important going on that evening, right?) and encouraging her to diligently get it done and praying the storm would pass so we could return to the park so that my plan would be a success. Good news!…the storm passed, she finished her homework and Stephanie, my brother, her uncle, his family and myself began to make our way into the park. With my nerves growing, we took a ride on the ferry to Magic Kingdom for Magic Hours. My heart was pounding so hard I thought people around me were going to turn and look at me! We reached the park without incident and I visited the restroom to double check that the ring was still in my backpack. It was, of course, and we proceeded into the park. We made our way up Main Street, U.S.A. at the Magic Kingdom and to the bridge just before Cinderella’s castle. We ran into a photographer and all of us had our picture taken there on the bridge. I began to think to myself, “Should I do it here and now? I could have a professional picture of our engagement, right?” But I decided to wait and mentioned that I wanted to get a picture closer to the castle. We made our way up to the front of the castle and Stephanie and I had a couple of pictures taken right in front of the castle by her uncle and my brother before entering into the proposal. Get ready, here it comes…. Her tears began to flow as she nodded her head and said yes! She couldn’t believe it! She thought for sure that I would not do it at Disney and she was so surprised that she was nearly speechless. We received hugs from my brother and her uncle and his family and congratulations from several other people that were around us watching. She was grinning from ear to ear and it was truly wonderful! I will never forget that early morning on June 11, 2012, when my dreams of Disney really did come true! P.S. She was so excited that the castle was purple when I proposed! The wedding pic is beautiful, Mike! I can’t wait to see more! Thanks for the link, Mike! What a beautiful wedding and beautiful bride! I love the color choices and her dress was just perfect on her! 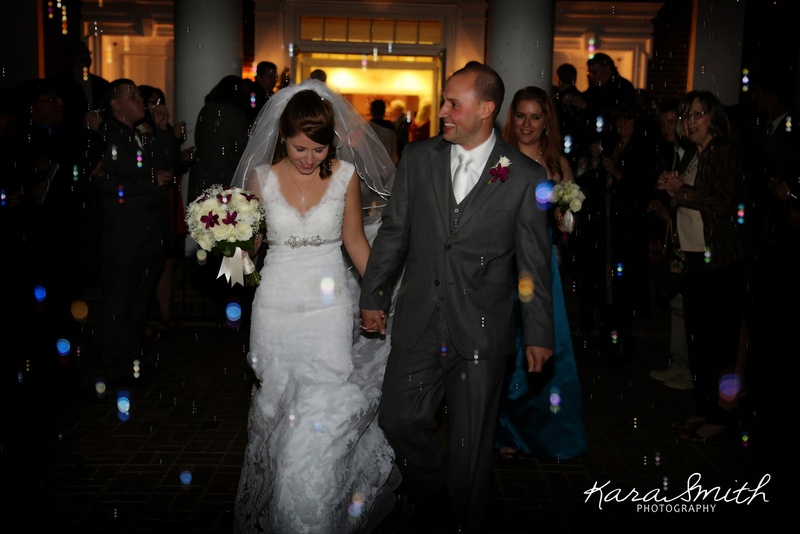 Yea, what Heidi said- we want more wedding photos! Makes me want to get re-married…fabulous story! Previous Post: Wordless Wednesday – Mickey Mouse! 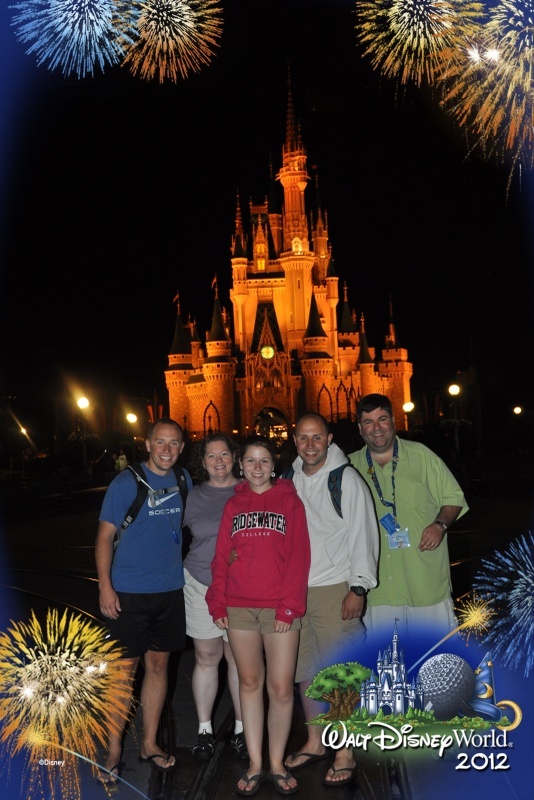 Next Post: Walt Disney World – Staying On Property vs. Off Property.